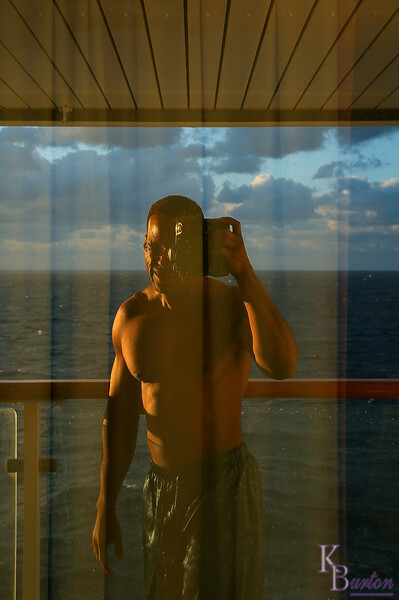 On our cruise to Bermuda with the gang from work, my bed was the only one near the balcony, and I drew the curtain behind me closed so the sunlight wouldn't disturb Michael and Ron who were fast asleep, like most people should be on vacation at 8 in the morning. I on the other hand am not most people, and the sight of sunlight when I pulled the drapes away from the sliding glass door, made me jump out of bed and go outside on the veranda. The warm air felt great, but the sky was still too cloudy to get the kind of rich golden sunrise shot with my camera I was hoping for. So after taking a few somewhat disappointing shots of the sea and sky, I turned to go back inside and noticed my reflection in the glass. The right side of my body looked golden brown in the early morning sunlight, and I decided to let my camera snap another shot or two before crawling back into bed to catch a few more Z's before breakfast. Wow, I took a shot like this one! Good work! Excellent shot! Really had a lovely golden tone from the morning light! Quite a handsome shot with the sun and shadows showing you off! awesome reflections, light and comp!